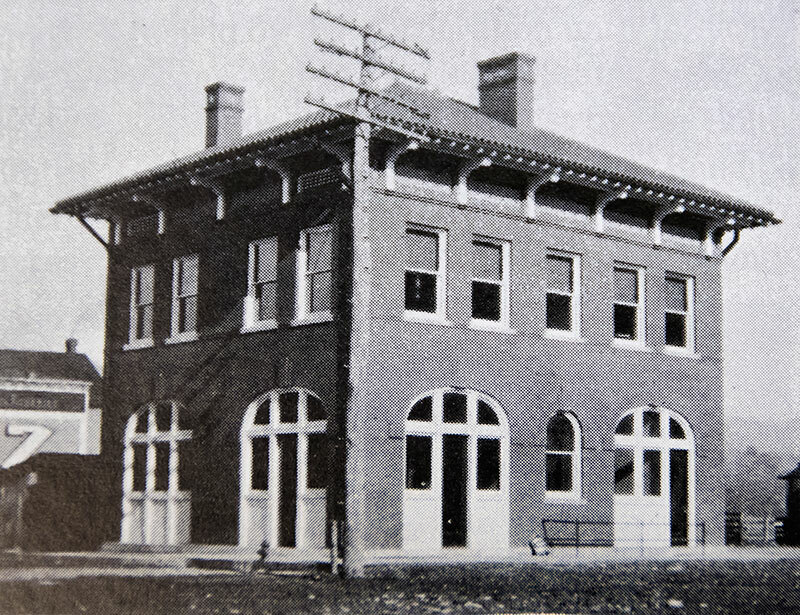 Early photo of the Bryson City Bank building. The street was unpaved. 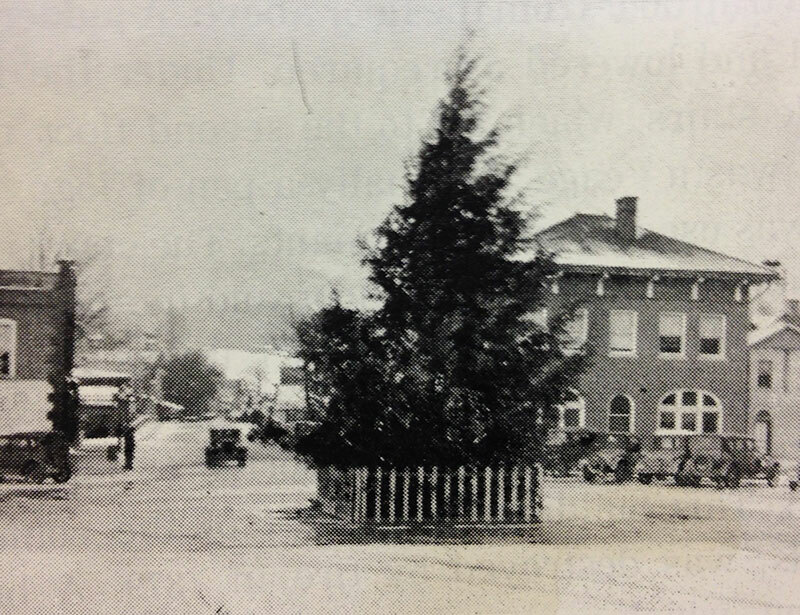 The town Christmas tree was in the middle of the intersection. The Everett Boutique Hotel’s opening in October 2015 concluded the third and final phase of renovation for the century-old Bryson City Bank building. The owners renovated the first floor of the building in 2010 and opened The Cork & Bean, a coffee house and wine bar, which expanded to a full restaurant in 2013, and became The Bistro at The Everett Hotel in 2015. Finally, the second and third floors were renovated as the hotel and rooftop terrace for hotel guests. The Bryson City Bank was established in 1906 with an original capital of $5,000. For more than a year it operated out of a railed corner in the D.K.Collins General Store, which stood on the the site of the present day Chamber of Commerce building on Main Street. In 1907, land was purchased and construction began on the Everett Street building. Organized by Stanley W. Black, D.K. Collins and others, Bryson City Bank was one of the few small banks able to survive the financial crises in the early 30s and pay the depositors in full. This was made possible in part by an infusion of added capital from local investors and a secured loan from a wealthy Chicago businessman — Mr. Black’s brother-in-law — Louis Fischer. Bryson City Bank occupied the Everett Street building from 1908 until the mid 1960s. At the celebration of the Bank’s 50th anniversary, with total resources exceeding a million dollars, Bryson City Bank board chairman Black announced the merger with Northwestern Bank. Soon thereafter, Northwestern built a new bank building on the site of the old D.K Collins General Store, where Bryson City Bank first began. Mr. Black headed the bank during its entire stay in the Everett Hotel building. After Northwestern moved to its new location, the old bank building was occupied by the Swain County government and The Swain County Chamber of Commerce. The Stanley Black family made significant contributions to Bryson City’s growth during the early 20th century. In 1929, Stanley’s wife Marianna started the town’s first public library, initially operating out of two suitcases. After outgrowing several locations around town, the present-day Marianna Black Public Library was built in 1975. Operations are still funded, in part, by Mrs. Black’s generous endowment. It should be noted that some historical accounts date the bank’s charter in 1904 and the building’s construction in 1906. Since the only verifiable date is the Bank’s purchase of the land on May 31, 1907, it’s safe to assume the 1908 construction date is correct.